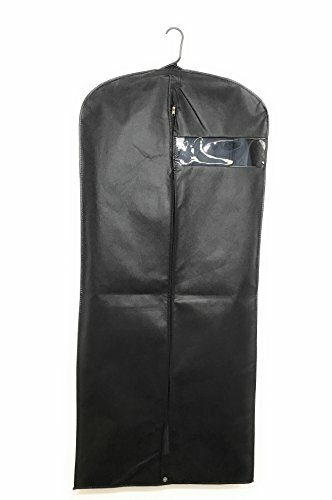 Garment Bag Covers By MYTH21 for Luggage, Dresses, Linens, Storage or Travel Suit Bags with Clear Window Pack of 5 (Black, 54) by MYTH21 at Epfup. Hurry! Limited time offer. Offer valid only while supplies last. Garment Bag Breathable Suit Bag by MYTH21 Features: Brand new and high quality. Ideal length for suits, shirts, trousers, tops, jumpers etc. Features: Brand new and high quality. Ideal length for suits, shirts, trousers, tops, jumpers etc. Protects clothes against dirt, dust & moths,keep your clothes clean. Light weight and portable for travel. DUSTPROOF SUIT BAG: This set of 5 garment bags are made of top quality breathable Non-Wonven fabric. Protect your clothing from dust and pets hair, keeping them fresh, clean and wrinkle free. INSTANTLY KNOW WHAT INSIDE SUIT COVER: You can find the cloth conveniently and quickly without opening the suit bag. CAN BE REUSED: This garment suit bag can be washed, so you can reuse it for a long time. Also it can be folded in a small size easily, very easy to store when you don't use them. Save lots of space. If you have any questions about this product by MYTH21, contact us by completing and submitting the form below. If you are looking for a specif part number, please include it with your message.